Jesus has been teaching a variety of things by the time we arrive at this parable. He begins with the Beatitudes, then talks of salt and light, and how He come to fulfill the Law. He covers murder, adultery, divorce, oaths, "an eye for an eye, " loving your enemies, giving to the needy, prayer, fasting, how we are to store up "treasures in heaven," not worrying for our Father supplies our needs, judging others, asking, seeking, knocking, how we are to enter through the "narrow gate," and how we must watch out for false prophets. Wow. In fact, Jesus kicks off His ministry with this Sermon on the Mount. He was baptized by John in the Jordan, called out into the desert by the Spirit and underwent temptation by Satan. He called His disciples and is now going about the Galilee, healing the sick. He climbs a mountainside, and sits down. He is inaugurating His ministry. My thanks to Ray Vanderlaan for pointing out that Matthew is presenting Jesus as the new Moses. He is on a mountain and brings forth a new law--one that gives serious consideration to the Old Testament Mosaic law, but with Jesus' added elements of love, compassion and authority. He is fulfilling the Law, for He will do what the Lord spoke of through Jeremiah: "'This is the covenant I will make with the people of Israel after that time,' declares the LORD. 'I will put my law in their minds and write it on their hearts. I will be their God, and they will be my people.'" Moses brought down the inscribed stones of the Covenant from Mount Sinai. This Covenant was an agreement between God and His people to abide together. God expected certain things from His people, and their obedience would lead to blessings a-plenty from Him. Disobedience would equally lead to chastisement from His hand. Jesus, when finished, gets this reaction: "When Jesus had finished saying these things, the crowds were amazed at his teaching, because he taught as one who had authority, and not as their teachers of the law." The crowds rightly sensed a new Covenant was in the offing--Jesus was not simply teaching what the Law said. He was teaching what the Law foretold: that God was seeking to inscribe His law on the hearts of His people, and that His definition of "His people" was going to embrace the whole world. Did the crowds understand the bigger picture? Probably not. But the times, they were a-changing, and the crowds sensed that. His listeners are very familiar with the desert and flash floods. 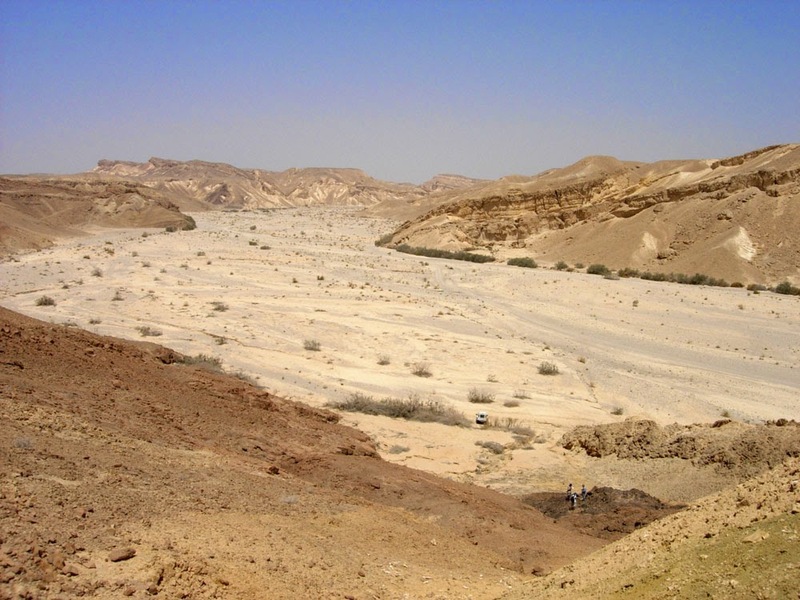 The Hebrews' history is desert history, and the geography influences their analogies. I thank Ray Vanderlaan for his teaching on the influence of the desert on the Jewish people. A wadi is a seemingly dry stream bed. The trees are rooted along its outer banks, to make use of the subterranean water. The wadi is a quiet place, with rocks and sand, and the heat blazing down. So, Jesus starts with wise man building his house on a rock. Who is this "wise man?" The man who hears Jesus and puts His words "into practice." This guy doesn't just go and build his house anywhere. He is wise in learning where the safe and stable places are. I might build my house near this wadi. It looks harmless enough--it is in the desert! How much water could there be? Sure, the wadi shows evidence of water flow, but I am thinking it flows more like a stream. The quantity of water can't be overwhelming at any one time. Besides, in a desert, a cool flowing stream would be nice and refreshing. Where's that sunny day? Where's that gentle refreshing stream? 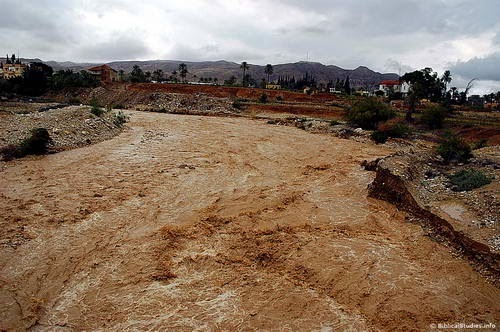 This is a flash flood in a wadi. It rains in the distant mountains, and the accumulating water comes roaring down the wadi. You might not even know it was even raining until you hear the roar. But by then, it may be too late to get out of way of the flash flood. Isn't this life? Rains come, the waters rise, and the winds beat against our house. The very ground beneath our feet is swept away by a raging torrent we didn't even know was in the making. Boom! So, who is the foolish man? The one who looks at the surroundings: the sunny day, the heat and blue skies, and says, "This looks good. All those words of this new Teacher, Jesus...Well, they sound good. But, I can't relate. I have the Law. Good enough. Yet, when life gets really tough, I am not even sure that God loves me, because I don't uphold all the rules and regulations..."
Jesus knew that the very foundation of Judaism, the Temple and its system of sacrifices, would be swept away by the raging torrent, as it were, of the Roman army in 70 AD. His listeners were going to need a stronger, more enduring foundation: not one built of stones, but one built in the heart. The New Covenant would be written on the hearts of those who believed in Jesus, and even the severest flood could not wash Him away. He was and still is the Rock. Jesus talked of false prophets, whose words and easy demands will seduce us. They promise us an endless parade of sunny days and blue skies. But Jesus hears the rainstorms in the mountains. He hears the oncoming torrent. He wants us to be firmly built on a rock. He offers Himself: His blood, which washes away our sins; His love, which reminds us we are sons and daughters of the King; and His grace, which forgives us when we are foolish. Rain, wind and torrents will come, but at the end, you will be standing if you are standing on the Rock.